Some unexpected travel today, so a friendly reminder the purpose of this blog is, at base, mercenary. Hire me. Ask me to come and give a talk. It can now be revealed that my recent secret trip was to secure a reverse MBAectomy, a painful operation which has frappéd my cranial capacity a statistically significant 342.7%. I am now qualified to be, and do hereby accept the title of, Thought Leader. Forbes defines this pinnacle of business leadership thusly: “A thought leader is an individual or firm that significantly profits from being recognized as such.” This is right: I am ready to profit from being me. Mashable says, “a thought leader has earned his or her title because that person’s ideas have gone viral.” Many on this very blog have said that Briggs’s philosophy must be the result of some sickness, so I’ve got the viral prerequisite nailed, too. I’ve been on hundreds of Thought Leader sites and have noticed the following phenomenon. All leaders have mastered the Thought Leader hand gesture; a kind of soft yet authoritative one-handed karate chop (the off hand holds an advance-a-PowerPoint-slide clicker device). The chop says, “I’m so bursting with thought leadership that I don’t have to raise my voice. But mess with me and I’ll talk about my credentials.” I’ve worked on this for hours and I’m very convincing. Not only that, but I can now use the following list of words without blushing or choking from embarrassment: bucketized, action-item, partnering, peel-the-onion, and of course data-driven. I can synergistically turn any noun into a verb, and grow any verb into a noun—when I have the bandwidth. This momentous announcement has also appeared on Twitter, so you know it’s true. Stand by for future announcements of my patented demotivational lectures. For example, my “Why You’re Wrong” series unpopular with climatologists and epidemiologists the world over. All fees are painful and necessary, just like taking medicine. Call today. Ask about my St Valentine’s Day special. Can I become a thought leader as well and do I really need an MBA? I’ve already got the “you’re wrong” down pat. Next on the list aim for peerless peer of the realm. I’ll see if I can get you in. There’s an initiation fee, you know. Cash initiation fee. Details to follow. Hmmm. I think I remember that Star Trek episode. They used their Big Brains to create illusions so they could control lesser beings. Captain Kirk had a suitably traumatic time. Possibly this is all very appropriate for a statistician. Surely Steve Crook meant to say Captain Pike! Shame they never made to 2012 much less 2013! I expect we’ll find that thought leading is done by asking leading questions. You are a sort of though leader, no *****. You point out how things are broken (and many listen to these proclamations), but from my readings from you blog you never tell how things should be fixed! Except in the vaguest of ways such as â€œscrap statisticsâ€, â€œstart overâ€. As I see it you have a real job cut out for yourself, which is to show researchers the way, that is show them how to fix things, tell them what they should be doing when it comes to statistical analysis etc. Take as an example your post yesterday on logistic regression. If we should not use logistic egression, what should we be using? If we should not be using observational studies, what should we be using? Remember, I the real world people have to make decisions, and we need evidence to do so. How should we go about creating that evidence? It is the job of the statistician to provide us with the right tools. If all research is done only by persons that understand these things in great depth, very little will get done, since there are too few of these gifted individuals. Perhaps logistic regression should be made as easy to use as a pocket calculator. To use a pocket calculator you do not have to have a PhD in the engineering of electronics. You could be a real thought leader Briggs! Write a book, give a course etc. telling us what we should be using if not logistic regression etc. 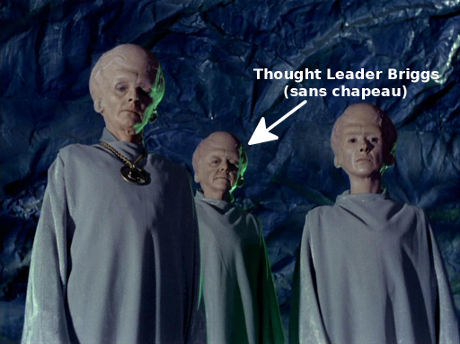 I’m not sure if I’m qualified for thought leader but I’m certain I can qualify for thoughtless leader. Where do I sign up? As an unambiguous Thought Leader, I hear your request. I feel the pain you experience as your thoughts wander aimlessly through the gloom. I therefore will heed your wish to be led. I invite you to read those classic posts which you missed which have to do with “predictive inference”, on the differences between logical probability and subjective Bayes, the tea tasting lady, the series of Ithaca teaching, and to read between the lines on the latest series of cancer of the albondigas. The relative risk series surely showed what was wrong, but hidden in it was always what was right. Those marvelous pictures just were predictive inference on display. But with the glad news I must also bring bad; indeed, the worst. Certainty, even acceptable probabilities approaching but not reaching it, is not always to be had. Even in cases where we’d like it to be. Even in cases where we’re desperate for it. Sometimes, even when we want to do something, doing nothing is the best decision. I keep telling people that it takes a lot of effort to improve on doing nothing but no one will believe me. Wouldn’t increasing the efficiency by doing nothing twice as fast be an improvement? You’d think there would be a app for that. If you can’t spare the time to sharpen your axe, try to find problems that resemble watermelons. There’s a workable design buried inside that mess – you just have to chip away the bits that don’t work to set free the beautiful design that lies locked-up inside. Be proactive – those coworkers aren’t going to just stab themselves in the back. I’ve always wondered how you ork a cow. There seem to be a lot of people doing it. Certainty, even acceptable probabilities approaching but not reaching it, is not always to be had. Even in cases where weâ€™d like it to be. Even in cases where weâ€™re desperate for it. Sometimes, even when we want to do something, doing nothing is the best decision. This is something that deserves, as the song says, to be “written on the subway walls, and tenement halls, and echoed in the sounds of silence”. I put it a bit simpler, however. My take on it is that the three most important words that a scientist can learn to say is “We don’t know”. Milton: You would indeed be a great Paid Thought Leader. That last directive is a jewel! we are eagerly awaiting your deep thoughts on atheist moral. It’s occurred to me that the top image may explain why you espouse wearing restrictive clothing such as a hat and tie. Is not wearing these an MBA thing? There’s an individual with a swelled head currently playing legal tennis on the DC (among other) courts. That person doesn’t wear a hat or tie either. Surely you must know that Thought Leadership is a dead end. Fewer people think nowadays. It’s Feeling Leadership that attracts the cash and where you should be putting your efforts. Gary is correct. If you want to get on TV, say Dr. Oz, you need to speak to the dead or hawk questionable diet aids that make people feel good about themselves. No one who is in research on cancer, etc, seems to make it to the spotlight. Feelings, nothing more than feelingsâ€¦â€¦..
After following your blog for several years, I was hoping to be smart enough by now to become a Bayesian. Therefore, this would also have allowed me to become very rich. Sadly, this is not the case, but I do have a large jar of pennies I could donate towards the upkeep of your deep thoughts.